This was another road trip (via motorcycle) from Metro Manila to Tanay Rizal via Cogeo route. For commuters, take a jeepney bound to PAENAN or Sampaloc either at Cogeo 2 or at Sumulong-Marcos Highway junction. Then ask the driver to drop you off at PSD Outpost. Please note that there is no other marker at the entrance of the trail. At the PSD marker, you will see a closed gate but a small opening at the right will lead you inside to the wide trail/road down to the neighborhood area. Updates: Ask the jeepney driver to drop you off at the junction of Barangay San Andres. From there, take a trike or habal-habal to the barangay hall where you will register and secure a guide. The trail is gradual but with the barren land coupled with high humidity, we trekked hardly than expected. We also passed by remains of forest fire and landslides as we crossed Mt. Batolusong. At the campsite if you are facing Mt. Banahaw and Mt. Cristobal's, you have the view of Laguna de Bay to the right and Sierra Madre ranges to the left. Also, a beautiful mini-pulag view at sunrise plus a glimpse of nearby mountain's peak completes the Mt. Batolusong scenery. 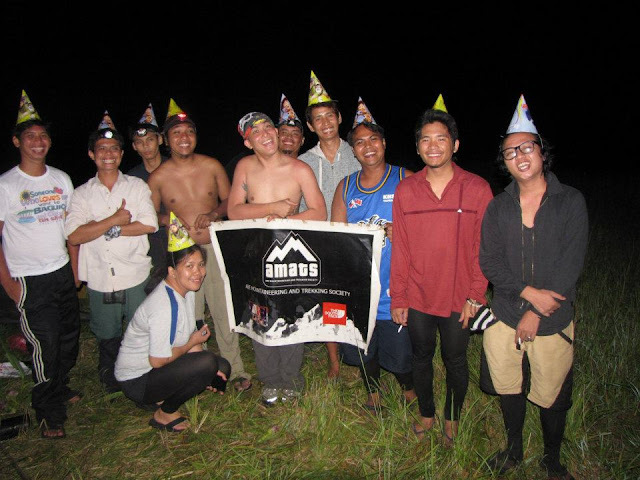 Thanks to the birthday boy and AMATS for making this climb possible. posible po ba makakuha ng guide dun,..may contact po ba kayo na taga dun sa sitio kay-ibon? maari po ba makihingi ng number? nakou, wala po kami contact eh... pag dating nyo sa marker ng PSD outpost, pasok lang kayo.. mababait naman ang lokals doon.. pag may nakita kayo, tanong nyo na lang kung may bata na pwede kayo samahan.. medyo malayo pa ang kabahayaan from the road, more than a kilometer.. Ask ko lang po kung gaano kalawak ang campsite sa Mt. Batolusong?ilang tent po ang kasya?bukod po sa mapatad campsite may mga posible campsite pa ba near mapatad? Gaano po kalayo sa campsite ang water source? Maraming Salamat po sa Info:) Mabuhay!!! I’m searching for a low budget adventure with my family this coming holiday and I guess this is the perfect one. Sir/Madam may I humbly ask some info about this Mt. Batolusong? May I know the budget per person? How about the trail condition? Or there’s a need for a Guide? If there’s a need how much is the fee? there is no guide requirement in climbing this mountain but kids do offer guideship at a minimal fee, I believe P150-P200 will do. At the PSD marker, you will see a closed gate. Just turn right to a small opening that will lead you inside then follow the trail/road to the neighborhood. You can opt to enjoy the falls first which is located at the right side of the trail. Just follow the sound that will direct you to the location of the falls. Bring insect repellants as there are plenty in the waterfalls area. As shown in the pictures above, the trail is wide and gradual but be careful when you cross the landslide area as you will be passing by a thin strip of land. Also, the trail can be muddy during rainy season and during summer with the barren-look, you will directly feel the scourging heat of the sun. ow.. on the budget, I believe P300 will do. More power and again thanks… thanks… thanks a lot. Good afternoon ask ko lang po kung safe naman for a solo-hiker or camper? hindi naman po mahirap ang lugar pagdating po sa trail? mainit po ba ang weather along sa trail and summit? safe to climb naman yung place but i cannot confirm full "safety" of solo hikers... yes, medyo mainit sa trail kasi open sya lalo na sa campsite. I would like to bring my girlfriend here for a change after holy week. She's up for it (mountain climbing, nature trippin' & stuff) but is the trek advisable for a newbie? I saw in another blog some leech or limatik (not sure) that we have in Makiling. Did you guys climb summer time? hi sir, there are mountains like Makiling and Sampaloc Falls in Mt. Romelo that are known for limatik all year long... For Mt. 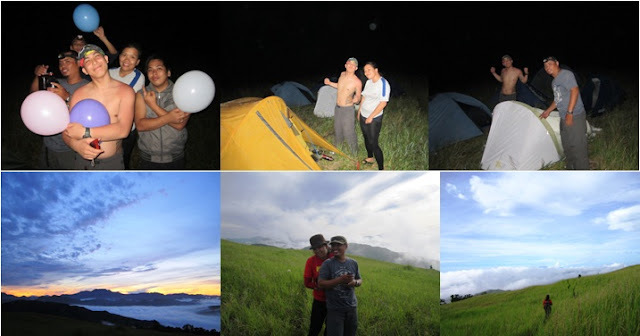 Batolusong, we didn't see any sign of limatik and for newbie, the trail is friendly. Sir good afternoon, kailangan pa po ba ng permits pag aakyat dito sa mountain? do you have updated/reliable contact numbers that we call/text? thanks po. Kakagaling lang namin last thursday and wala na pong permit 09993510510 Jeffry Amit name ng guide namin. Akala ko walang pwedeng akaytin dito sa Baras, Tanay Rizal ay may naakyat kami 1 sa brgy Cuyambay yung Mt Masungui ne Rockie siya need to improve ng locals yung trail para makilala siya, registration is at brgy cuyambay with a minimal 25 peso fee, and guide 500.00, meron siyang falls Tuntun falls kaya lang di na namin nakita after lunch na kami nag start mag trekk kay plano naming balikan. Yung Mt Batolusong ang latest is No need for permits dami nilang tourist guide (500.00) and 20 for reg. at brgy San Andres. ok siya compare sa ibang mountain malilim may falls na pwede kang maligo and the locals are very accommodating and friendly. whew.. sir, trip din namin yun masungi.. curious sa rockies..
May i ask if you have a number of your tour guide in Mt Masungi? May I ask kung safe ba iexplore ang Mt. Batolusong ng magisa? And can you give me some advise if in case I will go there alone?